As smartphone owners begin to store more sensitive data on their devices, manufacturers are exploring new ways to keep information safe. Though not the first to market, Apple's debut of Touch ID on the iPhone 5s shows us that security could be simple to use. With new uses for mobile devices, security will be an important component to not only securing data, but also to reducing fraud. With mobile phones aiming to replace credit cards with payment systems like Apple Pay, Android Pay, and Samsung Pay, biometric security will make it easier to pay for goods while keeping your financial information safe through the transaction process. Borrowing from bats, Qualcomm's Snapdragon Sense ID 3D Fingerprint Technology promises to get a better read of your fingers through ultrasonic sound wave technology. With Qualcomm's tech, it doesn't matter how you position your finger on your phone, and the technology could sense your prints through the glass display, metal chassis, or plastic body of your mobile device. Manufacturers no longer need a dedicated place on a phone or tablet to place a fingerprint reader, a move that could lead to even more compact devices. The ultrasonic waves inside the Snapdragon Sense ID will be able to detect a user's fingerprint even if the user's fingers are covered in sweat, lotion, or condensation - all advantages over Apple's class-leading Touch ID. Current fingerprint technology uses capacitive sensors to create a finger scan, but Qualcomm's sound wave technology could map out the ridges on a finger even in the presence of contaminants. Smartphone manufacturers are already testing Sense ID, and Qualcomm expects devices with the new ultrasonic fingerprint reader to be available in the second half of the year. Best known for its trackpad technology on laptops and smartphone displays, Synaptics is making a push into mobile security with the latest product in its Natural ID family. The VSF6170 Slim Slide Fingerprint Sensor allows smartphone manufacturers to integrate a slim fingerprint scanner onto the side of a phone or tablet. The space-saving sensor could be incorporated into small structures such as the power button, volume rocker, or on the phone's side frame. Synaptics claims that the ultra-slim design comes in at just 2.8mm thin. Because of the thin design, Synaptics' solution requires users to swipe their fingers, instead of just pressing their fingers onto the sensor like on the iPhone 6's Touch ID or the Galaxy S6's new fingerprint reader. Additionally, Synaptics claims that embedding a fingerprint scanner into the side of a phone allows for easier one-handed unlocking. With the same hand, you can now hold the phone and swipe your finger to unlock your phone. The sensor is being tested by smartphone manufacturers now, and Synaptics plans to start mass producing the new sensor late this year. Rather than placing a fingerprint sensor underneath glass, IDEX introduced a solution that would embed a sensor into glass. The company claims that this would lead to more accurate fingerprint scans, and one where the glass and scanner are part of the continuous design of a smartphone. "Most importantly the biometric performance from our in glass sensor is vastly superior compared to sensing under the glass, suffering none of the blurring or fading caused by sensing from underneath glass," said Dr. Hemant Mardia, CEO of IDEX, in a statement. In order to embed the IDEX sensor into the glass, IDEX says that the glass has to have a thickness of 500 to 700 microns, or 0.5 to 0.7 millimeters. Since Gorilla Glass 4, which is used on Samsung's new Galaxy S6 and Galaxy S6 Edge smartphones, has a thickness of 400 microns, IDEX's solution would not work on the front or rear cover glass of those devices. In terms of visual appeal on buttonless devices like that on the HTC One M9 and Sony's Xperia Z3, a fingerprint scanner embedded into the glass could enhance security while preserving clean aesthetics. 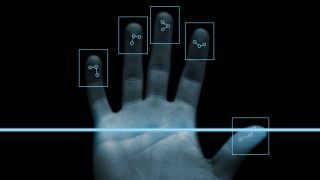 On industrial slates and phones on which thicker glass would offer more protection, IDEX's in-glass biometric scanner may be a good way to keep data safe and devices rugged.